Wxm (#9 /10/11) Louis Nuttall, Joe Whittington, Joe Newton. Subs: Kieran Wolland, Callum Terrell, Connor Bell, Regan Carthey, Liam Walsh. Action kicks-off 7.30pm at Maes Tegid - ex Reds with Bala: Dave Artell, Sean Smith, Mark Jones, Kieran Smith, Ryan Valentine & Rob Pearson. 3' 1-0 WREXHAM - a lovely finish by winger Joe Newton from 20 yards, low into the corner of the net for an early Wxm lead. Plenty of tired legs out there for the young Reds, but they are certainly not giving up. 90 5-1 BALA - Trialist with a shot after a left wing cross. Bishop, one of several 1st teamers in the side, almost in behind then. #WrexhamFC v Everton XI: Springthorpe, White, Royle, Clowes, Stephens, Nti, Clarke, Evans, Durrell, Bishop, Rushton. #WrexhamFC subs: Gray, Ashton, Hudson, Tomassen, Carrington, Keates, Moult, Jennings. #WrexhamFC will have Mason Springthorpe starting in goal. Left Everton in summer, came through at Shrewsbury - only 19-20ish. 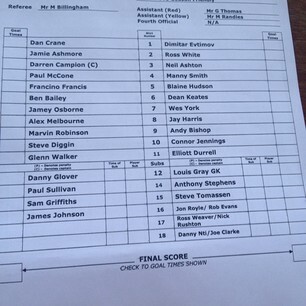 It's Everton's under 21 team that #WrexhamFC will face here at Cefn Druids. Can't be far off HT. Story so far: rushton put us 1-0 up. Everton levelled and have twice hit the bar. Fairly even though. Nti headed just over. He's get in the thick of the action to be fair to the trialist. Youth Team v Wolves: Airey, Phillips, Doran, Simpson, Smith; Adam Davies, Cartwright, Hammons, Jack Davis; Joe Williams, Danny Reynolds. Full commentary tomorrow night for @rhylfc vs @Wrexham_AFC from 19:15... Join us! Subs: Gray, Royle, White, Stephens, Tomassen, Evans, Clowes, Weaver, Durrell, York, Rushton, Lawson Okimeji (Acad), Jameel Ible (trialist). Jameel Ible Leeds-born youngster who had been with Guiseley, York C, Salford C & Stockport Co. He can play in central defence or right back.